As the founder of this crazy adventure called Future-ish, I'm often asked for examples of science, design, and culture coming together in meaningful ways. Specifically, many people think that given the increasingly fast pace of technology and consumerism, it will be difficult to maintain aspects of culture and tradition in our modern world. As I've often said, science and design certainly drive innovation in many ways but it is the element of culture that both connects each of us to our unique history and heritage AND brings us together so that we progress forward with greater meaning. I can't think of a better example of all this than the time, thought, and consideration that went into the the design and branding of Hawaiian Airlines' new regional airline, Ohana. The goal of Ohana (which is the Hawaiian word for 'family') is to bring people together from across the islands and connect communities. 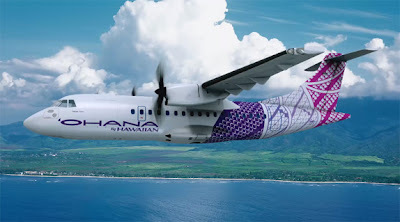 The connection to culture and tradition is expanded in the fuselage tail design, created by Hawaiian designer Sig Zane and his son Kuha‘o who used three traditional kapa patterns and the airlines island flight pattern to conceptualize the design. Each of the kapa designs has specific meaning. "Piko", a pattern inspired by braided ti leaves represents family and heritage. "Manu", represents both a bird in flight and the bow of a wa'a (canoe) acknowledging both origins and destinations. And finally, "kalo" symbolizes the shape of a kalo (taro) leaf which represents family and connection to others. More images and graphics are available at the Ohana page on the Hawaiian Airlines website.